There is a distinction to be made between Aleister Crowley as the scribe of the (Egyptian) Book of the Law, Liber AL vel Legis, and the Ankh-af-na-khonsu that is referred to as “prophet and scribe” in the book. Crowley believed in reincarnation, a common belief with occultists of the 20th century. He assumed that Ankh-af-na-khonsu was himself in a ‘past life’. Those of us who wish to follow the teachings of Aiwass, the communicating intelligence of the book, need not accept this. We are thus free to understand Thelema as timeless wisdom, embedded in the land of Khem. Perhaps one more “secret that has not yet been revealed” (Liber AL, II: 2) has now been disclosed. Aleister and Rose Crowley succeeded in breaking open an inner-plane time capsule. The transmission from Aiwass reveals the secret knowledge of the Setian cult of Ankh-af-na-khonsu, whose name literally means, ‘Life of the Sky-rider’. The Rider of the Sky was an Egyptian name for the Moon, in particular, the god Khonsu, the child of Mut and Amoun. To the Theban cult, Khonsu assumed all the attributes of other gods such as Atem Ra, Horus and Amoun, and carried the Left-eye of the Moon as his totem hieroglyph. The Theban cult revered Khonsu as a type of the Holy Guardian Angel, the soul that has united with the Angel, whose word is truth. The Book of the Law goes further than merely eschewing all religious beliefs. By denouncing human rationality as an instrument of the personal ego, the book declares war on all dogma, including that of material science. It would not have been necessary, in the 26th dynasty of Egypt, to include such repudiation in any knowledge transmission. Only a small portion of the book’s content, though, is uninterrupted by thoughts and questions from Crowley. The spiritual and magical doctrine of the cult of Ankh-af-na-khonsu is clearly expounded in the first thirteen verses of the first chapter. Through the second and third chapters, the tone of Aiwass becomes increasingly hostile and the knowledge cryptic. In fact, a verdict seems to have been reached as early as I: 17, when it is flatly declared, “But ye are not so chosen.” In the context of the preceding verses, Crowley is warned not to make the error of personally identifying himself with the “prince-priest the Beast”, the “chosen apostle of infinite space” (I: 15). He sought a way out of this by later suggesting that ‘ye’ must refer to others, not him! Adapted from ‘Priest Kings of Thelema’, Babalon Unveiled! Thelemic Monographs [Ordo Astri]. The Egyptian Tarot of Thelema trump for the 28th path of Aries is Hrumachis IV. Hrumachis, the Egyptian Sphinx, has various names, including Hormaku, Horakhty and Ra Hoor Khuit. The esoteric title of the Tarot trump, traditionally called ‘The Emperor’, is Sun of the Morning: Chief among the Mighty. 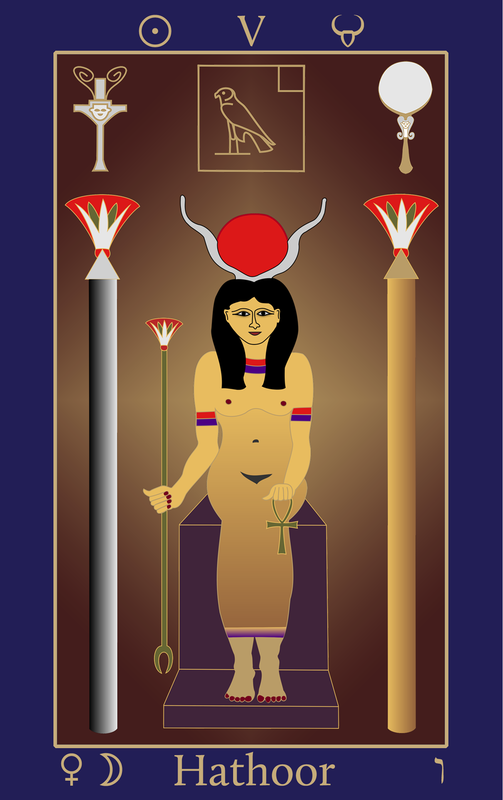 The Egyptian hieroglyphic name of Hor-em-akhet, from which the Greek form Hrumachis is derived, is at the top of the Tarot picture. 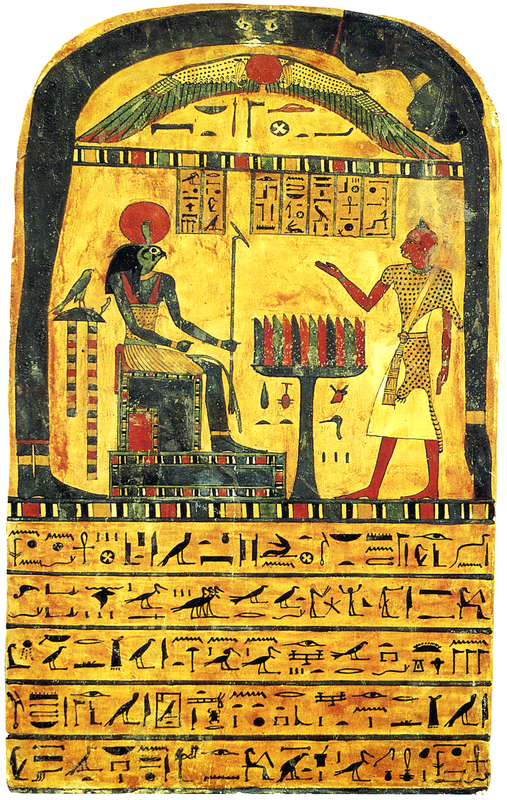 In the centre is Ra-Mentu or Ra Hoor Khuit, based on the Stele of Revealing. As Hrumachis, Horus is fully raised to the sky or heaven. The Sun and Serpent crown affirm his identity with both Ra and Typhon-Apophis. He wears the leopard spots, emblematic of the ‘space-marks’ or stars, and the gift of divine prophecy. His nemmys is night-blue, the colour of the body of Nuit, which encompasses the whole horizon. The 10 stars on the platform of the throne are the sephiroth in Malkuth of Assiah. The 22 stars grouped around the rectangular symbol of the Golden Mean (phi ratio) on the throne, the Foundation of the Universe, are the 22 scales of the Serpent of Wisdom. The God bears the Set-headed was sceptre of priestly will, ordinance or authority in his left hand, while with his right hand he sends forth spiritual power, which is as joy to the blesséd and woe to the Evil Ones. In the lower section of the Tarot picture, beneath the throne of Hrumachis, is the hieroglyphic name of the Sphinx who gazes eternally at the equinoctial point on the horizon, depicted here by the akhet or ‘sun in the horizon’. The astroglyphs for Aries and the Sun are shown on the border at the top of the card, for the Sun achieves his exaltation in Aries at the vernal equinox. On the lower edge of the card is the astroglyph for Mars, the ruling planet. Next to that is the symbol of alchemical Sulphur—for this is one of three Tarot trumps corresponding to the principles of Salt, Sulphur and Mercury. Tzaddi, the letter of the 28th path of Aries, is to the right of the title. In the (Egyptian) Book of the Law, Liber AL, III: 34, Hrumachis is the name of Horus as risen Khu, or Sphinx. But your holy place shall be untouched throughout the centuries: though with fire and sword it be burnt down and shattered, yet an invisible house there standeth, and shall stand until the fall of the Great Equinox; when Hrumachis shall arise and the double-wanded one assume my throne and place. Hrumachis is the ‘Lord of the Double Wand of Power’ of Liber AL, III: 72. I am the Lord of the Double Wand of Power; the wand of the Force of Coph Nia—but my left hand is empty, for I have crushed an Universe; and nought remains. The word is uttered at Thebes (Waset), the ‘Place of Ordinance’ in the South. The sonic vibration or 93 Current is sent forth upon the light-flowing stream of the Nile, until it is received by the priests of Heliopolis (Aunnu) in the North. There, in the holy city dedicated to the mysteries of the Phoenix, Hathoor gives birth to Horus by divine parthenogenesis (i.e., without the intervention of a father). Likewise, Nuit gives birth to Set, her star of manifestation—As above, so below. Horus ascends to the sky or heaven as an immortal Khu. And likewise, by the magick power of utterance, the soul achieves resurrection. The mysteries of Hrumachis, the enigmatic Sphinx, are further revealed in the ancient Egyptian form of the name: Hor-em-akhet, ‘Horus in the horizon’. 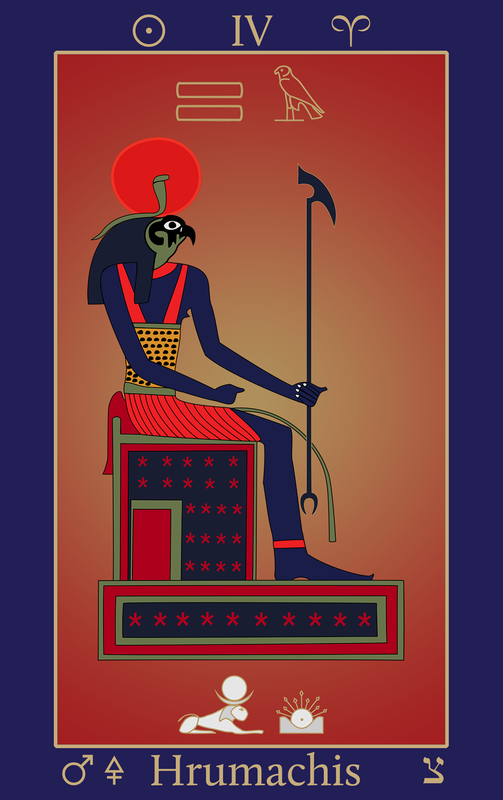 The variant form, Horakhty, is literally, ‘Ra who is Horus of the two Horizons’. The akhet, or aker, is a gateway or door. The double lion-gate of the sun’s ingress and egress to and from the underworld (spring and autumn equinoxes) refers to Horus as the abstract principle of the horizon itself. It is a particular part of the sky—for example, where the sun rises at the equinox—and an equivalent portion of the Egyptian underworld. 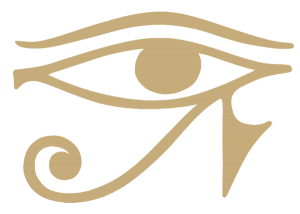 The name of Horus as ‘horizon’, or ‘dweller in the horizon’, relates to the circle, as does his eye. The horizon symbolises the primordial boundary or limit, the first division or utterance of Logos, by which the universe is defined as having shape and meaning. The horizon also designates the boundary or crossing, and the way of passing beyond all boundaries. Hrumachis was often depicted as a lion with the head of a woman, as with the Sphinx of the Giza plateau. At other times, the neter took the form of a hawk or ram—especially when linked to the god Khephra, the rising or emerging sun at dawn. In Egyptian hieroglyphic texts, Hrumachis is sometimes called HU, ‘authority’, and therefore Will. In some passages of The Book of Coming Forth into Light, Ra is said to divide himself into two parts, HU, Will, and SIA, Mind (Greek Nous). These are Chokmah and Binah of the Qabalah. Kings of Egypt were ‘Sons of Ra’ (Horus) from at least the 2nd Dynasty onwards. The Sun’s entry into Aries signifies springtime in the northern hemisphere. The full Moon after the equinox is in Libra, marking the first of the two balances of the year. The equinoxes are the aker gateways of the year leading into and out of manifestation. The head of the Sphinx of Egypt points towards the vernal equinox on the horizon; her tail marks the ‘fall’ or autumnal equinox. Thus, Hrumachis is Lord of all Aeons in time and space, and that which is beyond. The (Thelemic) key-scale Qabalistic correspondences for Hrumachis are of Tzaddi, the 28th path of the Tree of Life. The path extends upwards from Yesod (Moon) to Netzach (Venus). The title of the 28th path is the Natural Intelligence, for it is the perfection of the nature of all things under the orb of the Sun. The desire of Venus reflected into the mirror of the Moon makes impressions upon the Astral Light. Much of the work of occultism is to create new forms, as suitable vehicles for the incarnation of the mystic will to transcendence, of ‘passing beyond’. The magical arts require that key symbols are held and fixed by concentration of will. On the other side of the coin, forms are created to ensnare and enslave the soul, as revealed by the ‘fishhook’ of the letter tzaddi. As such, Hrumachis is the magical power itself, and indeed there is a close identification between Hrumachis and Khephra when all images are combined into the one image called Sekher Neter, the ‘Neter of Neters’. The magical power of the 28th path is the Power of Consecrating Things. To consecrate a thing is to reserve it for a special purpose; it is to make a thing sacred. Nothing is made sacred, however, that was not already sacred from the beginning. The mystic path thus involves travelling backwards, following the symbol back to its source with all other symbols in the infinite. The Aries Equinox and 28th path embody the principle of Governance. Horus is the pharaoh or king, in his life on earth. As Hrumachis, or Hormaku, he is all-transcendent. The governance of the life of earth is translated to that of world-systems. As Hrumachis, the Initiate has passed utterly beyond. But remember, o chosen one, to be me; to follow the love of Nu in the star-lit heaven; to look forth upon men, to tell them this glad word. When 1,356 is divided by its factor of 2, Hrumachis is equal to 678, ATh H-KRBIM (Eth ha-Kerubim). The Kerubim guard the Garden of Eden, as recounted in the book of Genesis, 3: 24. The Kerubim are likened to the Sphinx, having four ‘faces’ or cardinal quarters and zodiacal types, which are the Lion, Eagle, Angel and Bull. The number 678 is also that of ORBVTh (Araboth), the 7th Heaven, which is the mystic pyramid of the three supernal sephiroth beyond the Abyss. When 1,356 is triangulated, Hrumachis is equal to 452, ThBN, the ‘Head of the Dragon’. Thuban is the true pole star, the perfect alignment of heaven and earth. The word DBRK may also be construed as ‘Door of Avrek’, that is, the Gate of Sirius, the Star of Egypt and manifestation of Nuit. TzPVN, 226, is identical in sound and meaning to Typhon, the Greek name of Set or Apophis. The meanings of the word include, ‘profound; hidden’ and ‘North’, for the North is the place of Set-Typhon and therefore the arising of power in the magick circle between the two pillars. The number 226 is also equal to the Enochian URAN, the ‘Ancient Ones’, who preceded the race of men. When 1,356 is divided by its factor of 113, Hrumachis is equal to 12, the number of the Zodiac. The number 12 is also the mystic number of Kether, as HVA. The name HVA is etymologically related to HU, ‘Will’, an Egyptian name of the Sphinx. HU also happens to be a Druidic name of the Sun, and the name of a Babylonian sky god. Finally, 1,356 concentrates to 15, which is the Grand Number of the Pentagram and a number of Set-Typhon. In the rituals of the pentagram, the four ‘faces’ of the Sphinx of Nature are made manifest about the magick circle of the place. The will of the magician, Hadit in the midst, is the mysterious or esoteric ‘cause’ of the apparition. The 15th day is that of the full Moon, when Horus is fully revealed as Khonsu, the Sky-Traveller. The first full Moon after the spring equinox is the ‘real’ or natural Easter, the Eostre, and ancient festival of flowers, kalas or ‘moments in time’. It is by ‘seizing the moment’, the correct divining of the space-marks in time, that Horus is transformed into a Khu and the soul achieves her resurrection as an immortal star in the company of heaven. Space-marks have cosmic and earthly import; in the body of the Shakti or Scarlet Woman such ‘moments’ may equally be termed as ‘colours’, ‘kalas’, ‘shades’ or ‘emanations’. 2. The transformation of the soul into a living Khu, the mysterious assumption of Horus the divine hawk, and his relation with the Sphinx, is revealed in our translation of Egyptian papyrus Spell 78. The translation and commentary is given in, ‘Liber 364 vel Lux Occulta’, Babalon Unveiled! Thelemic Monographs. 3. The Book of Coming forth into Light is the more accurate name of the book that was falsely named by tomb robbers and Egyptologists, ‘The Egyptian Book of the Dead’. 4. Crowley did not revise the tables in Liber 777 to accord with the (Egyptian) Book of the Law, I: 57: “All these old letters of my Book are aright; but Tzaddi is not the Star.” Therefore in 777, the magical powers, weapons, gemstones and other correspondences of Aries are with the 15th path and not the 28th. The 15th path is properly that of the Tarot Star XVII and sign of Aquarius.